Make your own way to Genoa, where we’ll meet you at the airport and transfer you to your hotel. You’ll meet your travelling companions over a drink and dinner this evening. This golden stretch of coastline borders its more famous neighbour, the French Riviera, and is just as picturesque, boasting sandy beaches and palm-lined promenades. Located on a wide, sheltered bay, Sanremo is delightful to explore. We’ll do this today on our included tour in the company of a Local Guide. 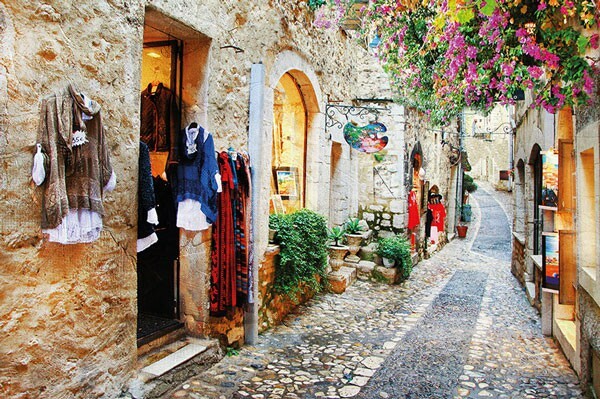 We’ll stroll through its charming old town, where a maze of lanes twist their way down the hillside. We’ll also admire a colourful display of exotic blooms amongst its exquisite manicured gardens and well-kept parks, and down by the seafront we’ll see a Russian Orthodox church, similar in design to Saint Basil’s in Moscow. The stylish principality of Monaco is a sovereign state that has been ruled by the Grimaldi family for more than seven centuries. It boasts luxurious hotels, exclusive restaurants and the highest number of millionaires per square metre than any other country in the world! The district of Monte Carlo is the sophisticated playground of the rich and famous, renowned for its famous casino, exquisite gardens, opulent boutiques and a grand harbour filled with expensive yachts. We’ll discover these glamorous sights on today’s full-day included excursion. Santa Margherita is one of the most elegant resorts on the Italian Riviera. You can discover its charm on our optional excursion, which also includes a visit to Portofino, which we’ll reach by boat if the weather is on our side. What used to be a quiet fishing village is now one of the region’s most exclusive resorts, filled with designer boutiques and a fine selection of restaurants and bars. Take a walk among its maze of streets to the Church of St Giorgio, which is close to the harbour. Perhaps take a seat at a café here and enjoy spectacular views across the bay as you sip a coffee or enjoy a chilled glass of wine. 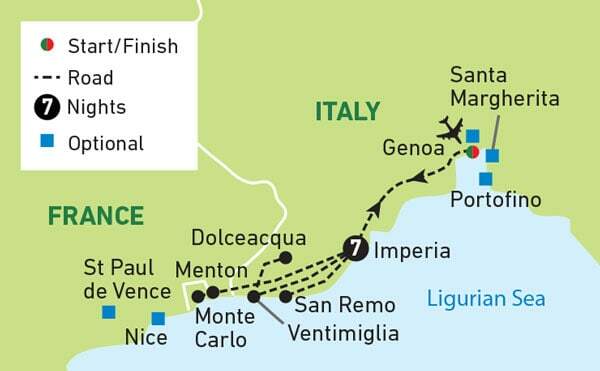 Today we’ll head to Menton in France, a coastal town on the Cote d’Azur close to the Italian border. Its streets are lined with pretty pastel-coloured houses and we’ll have time to take a stroll and admire the 17th-century Basilica of Saint-Michel, one of the finest baroque churches in southern France. Next we’ll cross the border back to Italy and stop in medieval Dolceacqua, made up of two beautiful villages connected by a stone bridge. Why not join our optional excursion to the medieval town of Genoa today. Highlights of our walking tour will include the old port and the house where explorer Christopher Columbus was born. Nice is the chic capital of the French Riviera and is where today’s optional tour begins. We’ll visit the Place Massena, the largest square in the historic old district, which is home to impressive fountains and stunning Neoclassical buildings with red-coloured façades. Recognized as a national monument of France, we’ll also see St Nicholas Orthodox Cathedral, which houses a vast collection of icons and decorative works of huge historical value. Later, we head inland to the charming medieval village of St Paul de Vence, built on a rocky outcrop and surrounded by ramparts.